Hinduism is refers to by some of its practitioners as “Sanatana Dharma” meaning “the eternal law”, or “the eternal way” beyond human origins, in other words Hinduism has always existed and unlike other religions (such as Judaism, Christianity, Islam and Buddhism), Hinduism was not founded by one individual. It is a fusion of many religious beliefs and philosophical schools and accordingly, it is said that Hinduism has 330 million gods. The word “Hindu” is derived from an Indo-Aryan/Sanskrit word “Sindhu” – it is the name for the Indus River. So at first it refers to a geographical term instead of to a religion. Starting from the 13th century the word Hindustan (meaning the land of Hindus) became a popular alternative name of India. 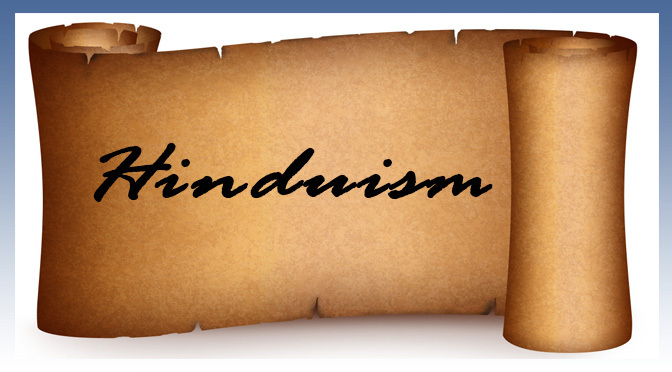 And since the 19th century the term “Hinduism” was introduced in the English language to refer to the religion, philosophical and cultural traditions of India. According to Wikipedia (Dec 18, 2010) Hinduism has over 1 billion followers worldwide (ca. 15% of the world’s population). It is the third largest religion by followers. Most Hindus are found in Asian countries (mainly in India, some in Bangladesh, Nepal, Pakistan, Sri Lanka and also in the US, the UK and South Africa). To call Hinduism “a religion” is actually too simplistic since it encompasses a very wide variety of beliefs. Hinduism is the most diverse and accepting of all religious beliefs. New Hindu gods and goddesses, as well as new beliefs are being added in Hinduism all the time. While there is no singular religious belief for all Hindus, below are the basic 9 teachings that are believed by most Hindus. Although typically Hinduism is categorized as a polytheistic religion (belief in many gods), actually Hindus also believe in a One, all-pervasive Supreme Being who is both the Creator and the Unmanifested Reality. This Supreme God or Highest God is called Brahman. Beside the One God, Hindus also believe that there are divine beings that exist in the unseen worlds (they are called devas and/or gods). Thus, temple worship, rituals, pilgrimage and personal devotional are needed to communicate with these high beings. Hindus believe that a “satguru” (meaning a “true teacher”) is essential to know the Transcendent Absolute (i.e. God). Hindus believe in the four Vedas. They considered the four Vedas as the primordial hymns and are the words of God. Hindus believe that the universe undergoes endless cycles of creation, preservation and destruction. Hindus believe that all life is sacred, therefore they practice “ahimsa” (non-violence/non-injury) in words and deeds. Hindus believe in “karma” – that is the law of cause and effect. That each individual creates his own destiny by his thoughts, words and deeds. Hindus believe that every soul goes through a reincarnation (rebirth). Every soul evolves through many births until all (bad) karmas are resolved and moksha (liberation) is achieved. Hindus believe that every individual must have a defined role in the world, this is called as their “dharma”. Dharma is what is expected of them in their familial, religious and social life to maintain order in the universe. A person’s dharma is determined mainly by their birth status, more popularly known as the caste system (i.e. Brahmins, Kshatriyas, Vaishyas and Shudras or to simplify: priests, warriors, traders and laborers classes). Hindus believe that beyond the body and mind of a human being is the Spirit of God within the soul. Hindus believe that by training to purify and refine the mind and senses, we can begin to feel the truth of this. There are various types of practices to do so but the most common practice is called the “yoga” (a physical, mental and spiritual practice of discipline, a part of which, including breath control, simple meditation, and the adoption of specific bodily postures). There are many diverse views on the concept of God in Hinduism depending on the denominations. The conception of God varied from monotheism (belief in one God), henotheism (adherence to one particular god out of several), to pantheism (belief that the universe is a manifestation of God) and even atheism (belief that God does not exist). However, as mentioned previously most Hindus believe in millions of gods/deities, with a Supreme God called Brahman (not to be confused with Brahma). Hindus who don’t believe in deities consider themselves monotheists. They worship a single personal god (known as an ishradevata), others may choose to worship a couple (such as Vishnu and Lakshmi) or triad gods commonly known as the Trimurti. Smartism (generally Smartas worship the Supreme or Brahman in one of the five forms: Vishnu, Shiva, goddess Shakti, Surya or the sun god and Ganesha – the god with the elephant’s head). Sruti (meaning “what is heard”) refers to the four Vedas (i.e. Rigveda, Yajurveda, Samaveda and Atharvaveda). These four major texts are revealed by the god Brahma. Smrti (meaning “what is remembered”) refers to other texts that were composed thousands of years after the Vedas. The Smrti is a class of Hindu sacred literature based on human memory. They elaborate, interpret and codify the Vedas. The examples are the Puranas and the epics of Ramayana and Mahabharata (this contains within it probably the single most influential text in Hinduism – the Bhagavadgita). As with Jesus return in Christianity, Buddha Matreiya in Buddhism, Imam Al-Mahdi in Islam and some other gods in pagan religions, the Hindu god Vishnu will also come at the End of Time in a reincarnated form of Sri Kalki. Hindus believe that the god Vishnu will be reincarnated on Earth for a total number of 10 times. 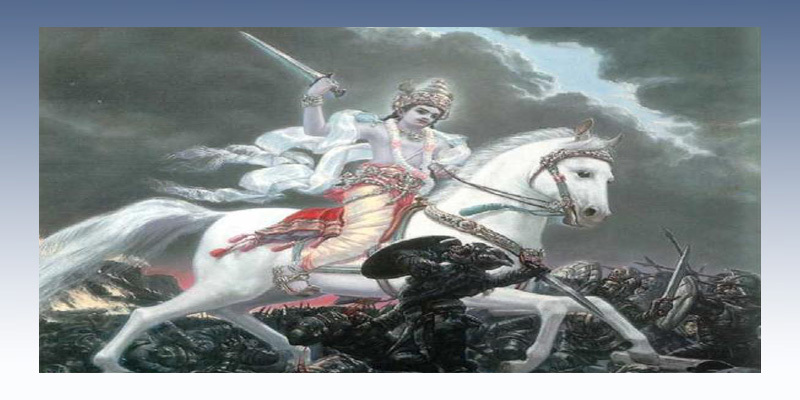 And in his last reincarnation he will appear as Sri Kalki (meaning “eternity”, “white horse” or “destroyer of filth”. The story is told in a religious text called the Puranas which foretell that Kalki will be atop a white horse with a drawn blazing sword. He is the harbringer of the End of Time after which he will usher a new era called the Satya Yuga after cleansing the present filthy/corrupted present era.